A simple and elegant fruit dessert that's sure to impress. 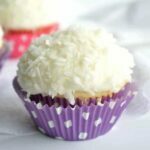 It’s National Pina Colada Day, and #SundaySupper is crazy for coconut with over forty sweet and savory recipes for you. 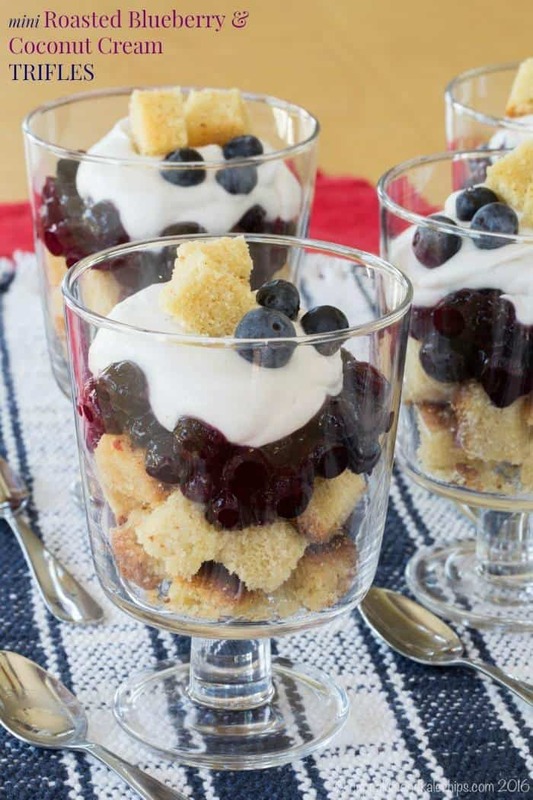 For an easy and elegant dessert with tons of summertime flavor, serve your guests these Mini Roasted Blueberry and Whipped Coconut Cream Trifles. The Hubby loves margaritas. He usually keeps a bottle of margarita mix and some tequila on hand for when the mood strikes him. I usually stay away from margaritas and daiquiris and pina coladas and the like. They go down like a smoothie or juice, which means way too much sugar and neon colors, and let’s not forget the alcohol for this girl. I usually stick to my wine or the occasional Dark & Stormy. Anytime we go on vacation and stay at a condo, like our trips to Smugglers’ Notch every two years, The Hubby always brings that bottle of margarita mix and tequila, plus a bottle of pina colada mix with the rum already added so all you have to do is add it to the blender with some ice and let it go for a whirl. You guys, once I’m on vacation and there’s a bottle of rum-infused coconutty goodness easily accessible in the fridge, I’m helpless. The first day I made a classic pina colada. The second day I added some frozen banana. After that I thought I should start diluting it with a little almond milk instead of all pina colada mix, oh and I also added a pinch of instant espresso powder. Then I layered it with a strawberry puree layer and some whipped cream for Lava Flows. The day after that I felt like layering was too much effort, so I just tossed the strawberries right into the blender. 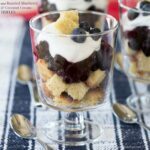 Mini Roasted Blueberry and Whipped Coconut Cream Trifles are a simple but elegant dessert with so many amazing flavors. The bottom can be any kind of cake or pound cake or even angel food cake you like. I went with my Gluten Free Potato Pound Cake which has a wonderful flavor itself. Then I roasted the blueberries with a touch of cinnamon which releases the juices, concentrates it, and intensifies the flavor. Top that all with a vanilla coconut whipped cream and it’s summertime heaven in a glass. 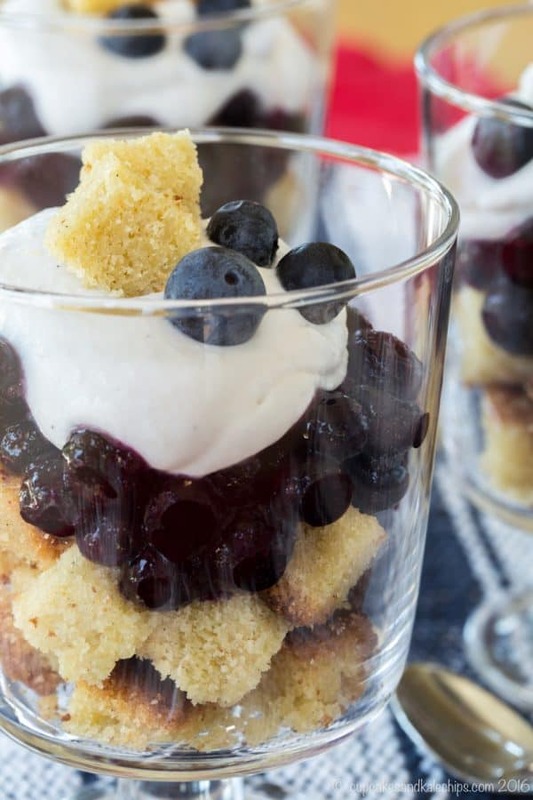 You can make make the components the day before and even layer the cake and berries, then just top with the whipped coconut cream before serving. 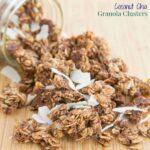 Then check out all of the creative coconut recipes at the bottom of this post! What is something you typically only indulge in when you are on vacation? Preheat oven to 375ºF and line a baking sheet with parchment paper (this is essential to avoid a sticky, burnt mess). Toss blueberries with cinnamon spread evenly on the baking sheet. Roast for 15-20 minutes, or until bursting. Cool and store in the refrigerator until ready to assemble the trifles. Divide the cake cubes between eight mini trifle bowls or other glasses. Top each with some of the roasted blueberries and whipped coconut cream. 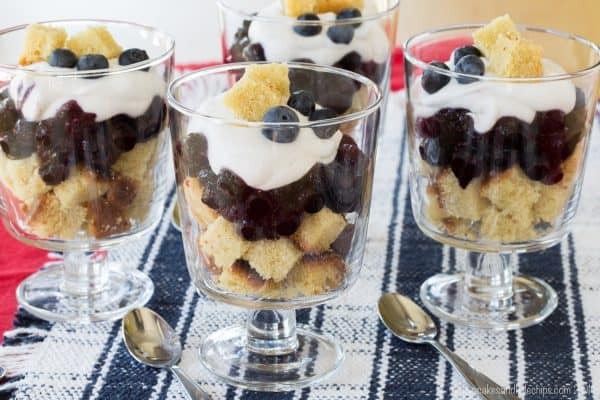 Garnish with fresh blueberries and additional cake cubes, if desired. 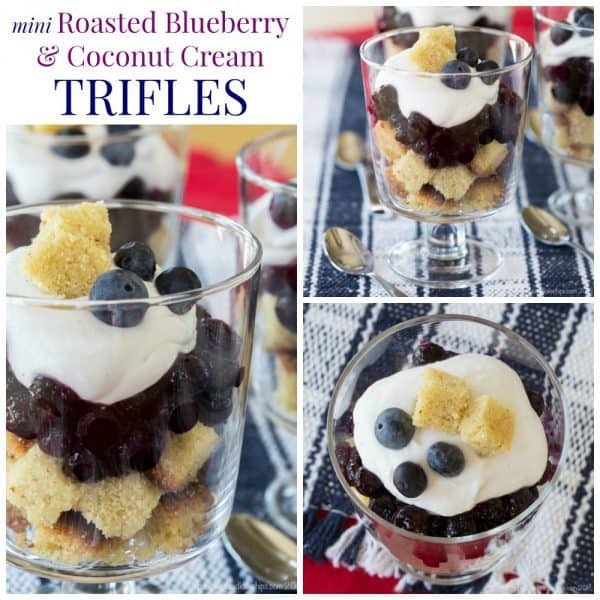 Enjoy this Mini Roasted Blueberry and Whipped Coconut Cream Trifles recipe! Thanks so much for joining us at Delicious Dishes! 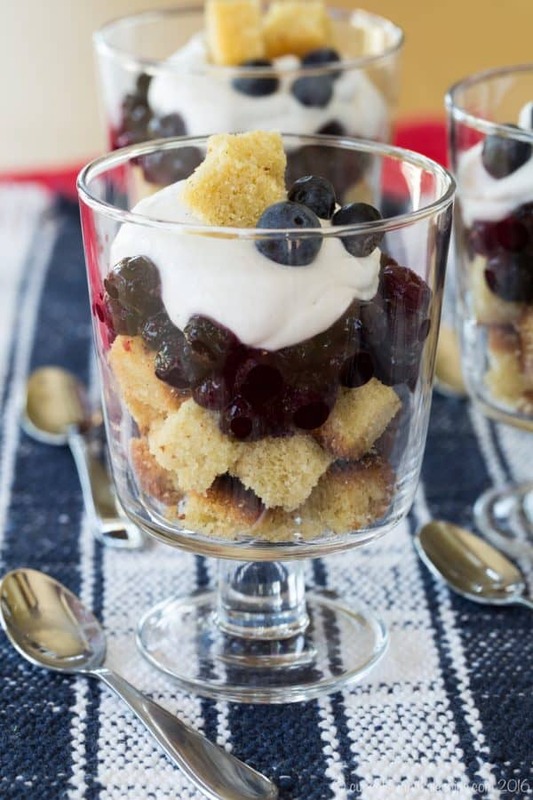 We love your Blueberry and Whipped Coconut Cream Trifles recipe and hope you’ll join us again this week! 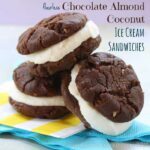 Whipped coconut cream sounds awesome! Thanks for linking up to Merry Monday! Pinned! Have a great week! 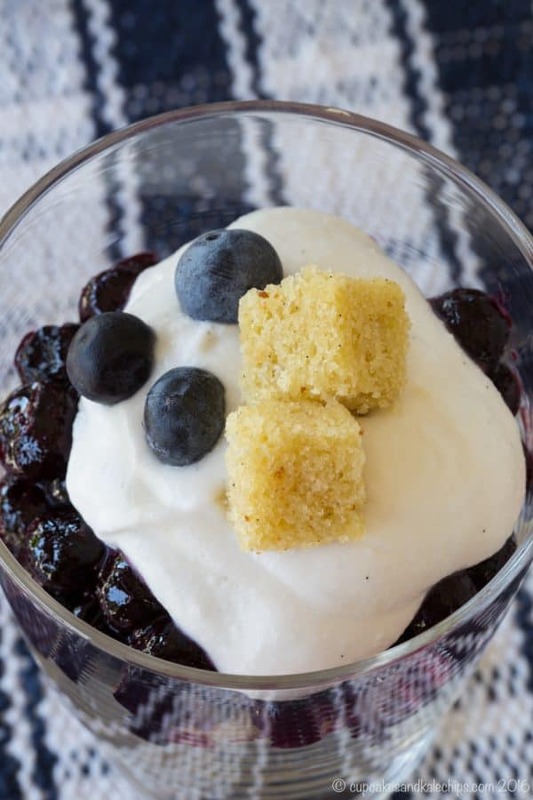 Blueberry and coconut sound so good together! Trifles are the best!! And yours are simply perfect for summer!